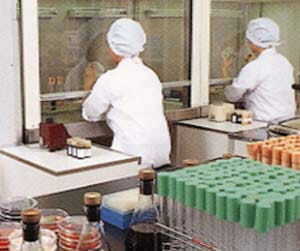 - Pasteurizing and quality inspection -Heating is the last stage of soy sauce production. The squeezed raw soy sauce is heated up to a certain temperature. This is not only for pasteurizing but for standardizing aroma and color and increasing stability of soy sauce by stopping the activity of the enzymes. This process is called "Hiire" (heating). It is an important process in the soy sauce production. After the heating process, soy sauce is checked by inspectors for not only chemical composition but color, aroma, and taste by using their eyes, nose, and tongue. This sensory inspection, called "Kikimi" in Japanese, ensures Yamasa's quality. People's five senses are great ! Experienced inspectors can easily tell very fine quality difference even though inspection machines can not analyze it. They are just like soumullie. Who are the inspectors ? Yamasa has people who are assigned for the sensory inspection at the Quality Control Section. They have passed the qualifying exam for a certified soy sauce inspector by The Japan Soy Sauce Research Institute.